Dementia is a broad category of diseases that affects the brain and its ability to think and remember. This course is designed to explore the variety of disorders that comprise dementia, including Alzheimer's disease. 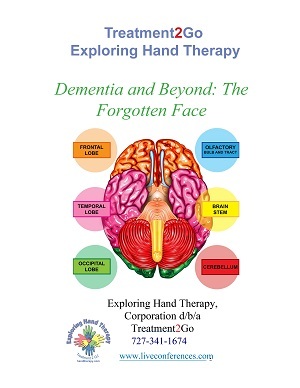 Causes, risk factors, stages of memory loss and therapeutic tools will be explored. The learner will increase skills and knowledge regarding Alzheimer's disease and other related disorders, as well as how to support family/friends in their role as caregiver. This course is intended for social workers, mental health counselors, and marriage and family therapists. To complete, the course must be viewed in its entirety with an 80% or greater score on the post test. Resources are available at the end of the course. Recognize the difference between dementia disorders and Alzheimer's disease. Check out the powerful Book" I Will Never Forget" written by an OT Elaine Pereira - the book has won dozens of rewards! This class surpassed my expectations. It was engaging, interesting and loaded with great points. Learned lots of great tips and techniques to use with my patients. This class was engaging and gave me clinical skills I can use right away. This is an excellent course! I highly recommend this to anyone working with dementia patients. Very informative. My husband had dementia. I would be very pleased to have a therapist aware of this information working with my loved one.